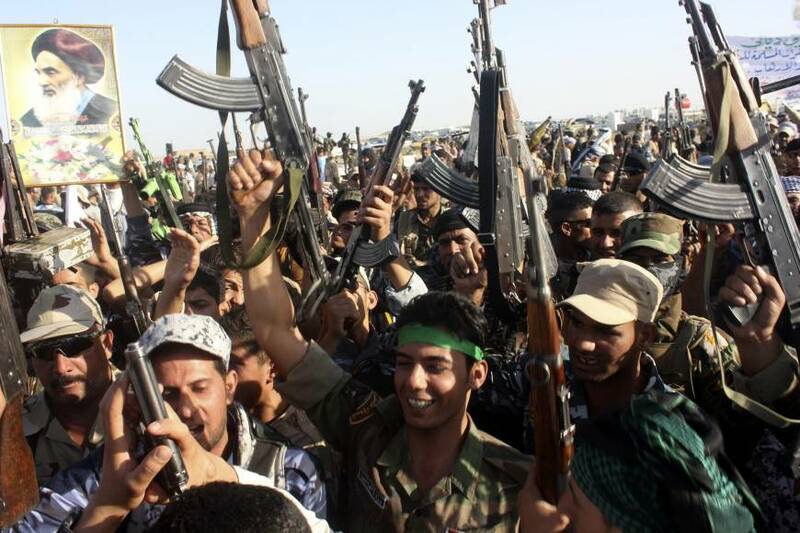 JNN 01 July 2014 Baghdad : Iraqi armed forces have killed over 60 ISIL terrorists and destroyed more than 70 of their vehicles in the latest operation in Tikrit. Citing statements by Governor of the Salahuddin Province Ahmed al-Jebouri, an al-Alam correspondent reported Sunday the Tikrit operation was carried out by an Iraqi armored unit comprising tanks and armored vehicles. According to the dispatch, Iraqi military operations in Tikrit and the Salahuddin Province remains in progress and thy key regions of the province are under army control. Following their offensive on Tikrit, the capital of Salahuddin Province, Iraqi armed forces approached the governorate building as well as other government installation in the city from four different directions and re-established control over them. The Iraqi is now engaged in flushing out terrorist elements from other parts of the embattled city and has urged residents of Tikrit to stay indoors until the purging operation comes to an end. Al-Alam reporter further reports that all regions of the area except al-Sharqat and Beiji are entirely under the control of Iraqi armed forces as army units are preparing to move into these localities as well. Meanwhile, Iraqi forces have so far destroyed five ISIL vehicles and killed 10 Terrorists in al-Sharqat while the rest of the Takfiri terrorists have fled towards al-Anbar. This is while a combined aerial and ground attack by the Iraqi army has killed at least 40 ISIL terrorist in the key city of Mosul as government’s military operations in other areas of Salahuddin Province continues. Iraqi tribal volunteers are also preparing to provide assistance to government forces in efforts to liberate Mosul and purge the entire area of the ISIL terrorists. Iraqi volunteer forces in the Kirkuk Province have waged an offensive against the positions of ISIL terrorists, expecting to purge the entire region from the Takfiri insurgents. Al-Alam’s Iraq correspondent reports that the nation’s volunteer forces from various town and villages across the country and initiated a ground attack on Saturday towards the ISIL-held al-Bashir village in the town of Tuz Khormato in the northern Kirkuk Province. According to the dispatch, fierce battle for the control of the Iraqi village is still in progress but the clashes are expected to conclude soon in favor of the volunteer forces, especially if they receive air support from the Iraqi air force. This is while the advance of the Iraqi volunteer forces have been hampered by ISIL’s use of explosive devices to set up booby traps along the road ways and homes in the area. The report further indicates that most of the volunteer forces engaged in the battle for al-Bashir village are Shia Turkmens and that two Men of Iraqi forces have so far been killed during the battle. Al-Alam reporter also cites Iraqi volunteer forces as insisting that if they receive air support by the nation’s air force, their victory against the ISIL terrorist in the area is certain. Iraq’s armed forces along with tribal groups from Diyala have also started a massive operation against the ISIL terrorists in the region. Elsewhere in Baghdad’s western suburb of Amriya, Iraqi government forces managed to disband a terrorist cell. Iraq’s Prime Minister Nouri al-Maliki has recently said Baghdad’s air and ground forces will turn the tide against the ISIL and its associated Terrorist Groups within days. Al-Maliki has vowed that the country’s security forces would confront the foreign-sponsored militants. This entry was posted in Iraq News and tagged Iraqi armed forces, Iraqi Army, Iraqi Volunteeers, ISIL, ISIS, Kirkuk, Salahuddin Province, Salahuddin Province Ahmed al-Jebouri, Tikrit, Tikrut. Bookmark the permalink.